An exclusive graph shows just how much worse this year's installation cycle is going than last year's. Somewhere in the infrastructure of Apple’s mobile ecosystem, something has broken. Last year, iPhone and iPad users upgraded in droves to the company’s new operating system, iOS 7. Just a week after its release, more than half had moved to the new system. A month after, more than 75 percent had made the jump. This year, the release of Apple’s newest mobile operating system, iOS 8, isn’t quite going like that. That system came out more than a month ago, but, according to the analytics firm Mixpanel, yesterday was the first day more than half of users were registered as using it. It overtook iOS 7 only last week. Before that, it had lingered in the 45-percent area for weeks. Thanks to this exclusive chart from Mixpanel, we can now see what those two upgrade cycles look like next to each other. 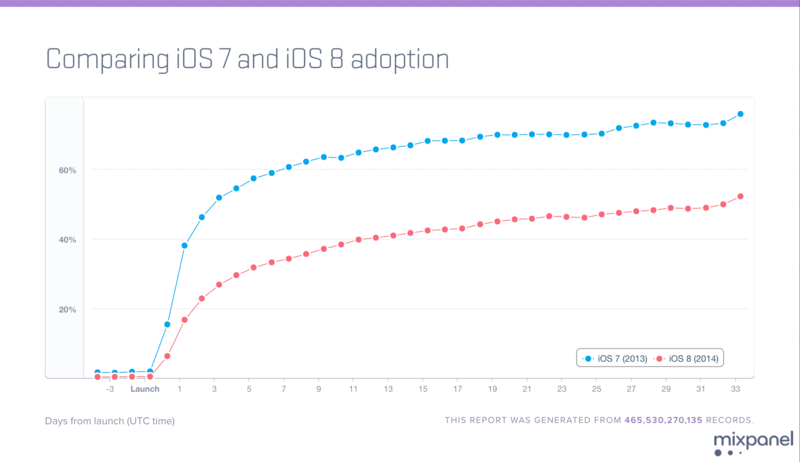 There’s been a big, sticky gap between iOS 7 and iOS 8 upgrade rates. Is that true? It’s not as though iPhone users have always been thrilled to install a new Apple concoction. In the fall of 2012, many balked at the new version of iOS—the sixth—after it removed Google Maps and replaced it with a mistake-ridden Apple-made clone. But even that year, iOS 6 upgrade rates had still overtaken the 60-percent mark a month after release—a milestone iOS 8 has yet to reach. Despite all the Maps hoopla, consumers still installed it. So we know something of what a software-associated rejection of a new iOS looks like. It looks better than this year’s pattern. Gruber eventually came around to another view, though—one that I’m inclined to agree with. It’s not the software itself, he says, but the storage space that it requires. Upgrading an iPhone “over the air” (that is, not connecting it to iTunes) requires some five gigabytes of space on the phone. Who has five gigabytes of space on their phone? Note this is only “over the air,” though. If you connect your phone to iTunes, it will upgrade it remotely, without requiring much extra space on the device. But many users long ago stopped thinking of their phone as tethered to a computer. Unless Apple reduces the size of that over-the-air upgrade, I wonder if an overwhelming upgrade to iOS 8 will ever happen. So taste isn’t holding the new iOS back—only terabytes. And while it’s not the “canary-in-the-coal-mine” situation proclaimed at first by Gruber, with consumers distrusting Apple en masse, I do think the lagging iPhone upgrades this time around reflect an infrastructural crisis for Apple. Most iPhones still ship with a default 16 gigs. That’s just not very much. The new iPhone 5Cs ship with only eight default gigabytes. If most users have switched to upgrading their phone over the air—and most, this chart hints, have—and if Apple continues to make phones with so little storage by default, then it will see its previously pristine upgrade rates plunge, and the nature of its products change. One final note: These kinds of rates do vary wildly from ecosystem to ecosystem. It’s apples-to-oranges, or at least free-mobile-to-paid-desktop, but Windows 8 hasn’t even reached 14 percent of the market yet. It was released in 2012. And Windows XP, a 13-year-old piece of software, is still installed on almost 24 percent of PCs.